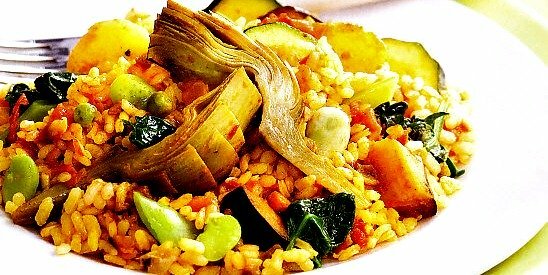 This vegetarian paella is so moist, full of flavor, and substantial, that you will scarcely notice it is meat-free. The green, red, and yellow bell peppers add a vibrant splash of color to the pale rice, while the tangy artichoke hearts, delicate peas, and juicy tomatoes ensure that this vegetarian paella will satisfy even the most avid carnivores. 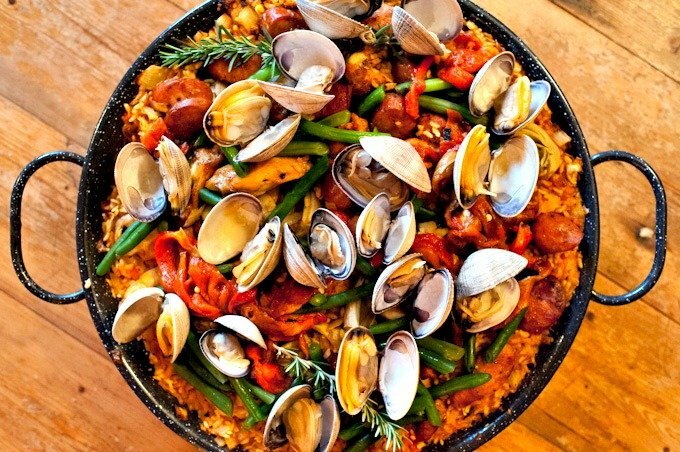 Heat the olive oil in a paella pan and sauté the onion and garlic until the onion is tender and translucent. At the same time, heat the broth in a separate saucepan until simmering. Pour the rice into the paella pan and sauté for about 3 minutes. Add the bell peppers and tomatoes and cook for a further 3 minutes. Add the simmering vegetable broth and cook over medium heat for 20 minutes or until almost tender and almost all the liquid has been absorbed. Stir in the peas. Sprinkle the artichoke hearts with a few drops of lemon juice and arrange over the rice in an attractive pattern. Continue cooking until the liquid has been absorbed and the rice is tender.